Bai Lin Gong Fu Black Tea is a famous black tea from Tai Mu Mountain, Fuding. 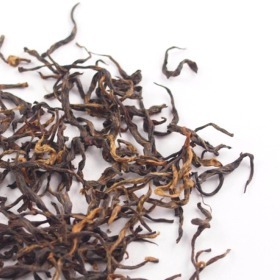 This tea is made from tender tea buds which are shaped into long curls with elegant golden stripes. This is also one of the oldest black teas in the world. This tea is made in a small village by one old tea master. One of the best Chinese Black Teas. We recommend using purple clay or porcelain tea ware. Rinse tea cup and teapot with hot water. Use about 2 grams of tea leaves (1-2 teaspoons) for every 225 ml of water. Steep tea leaves in hot water at 100°c (212°F) for 1 minute for the first and second brewing. Gradually increase steeping time and water temperature for subsequent brewing. If you like milk with your tea, add 10 to 15 ml of sweetened/plain dairy milk and stir. Has become my favorite black tea over Golden Needle. This tea is just plain satisfying. Taste is mostly chocolate and burnt sugar (brulee), but other notes are pleasing woody (vanilla) and tobacco (quite light so it stays tasty!). Definitely recommended, I just wish I had bought more. Very nice black tea. Buttery, sweet but not overly so. Recommend! Somehow, I do not like Chinese black teas as I am used to Indian ones. I expected more from reading the review, but did not sense much of the chocolatey notes mentioned in the other reviews. I did not dislike it but I did not particularly like it either.